It is clear in the preceding verse that it is His body of flesh, which He offered through death.Your conclusion that it is the word that redeems is illogical because the word does not die, but the flesh.Through the death of the ‘sinless flesh’ of Jesus, we are sanctified.The ‘we’ I am mentioning is the Church of God, to whom these epistles were written for.Hebrews 10:10 clarifies that further. The Church, or the ‘we’, is the entity being sanctified by the offering of His body of flesh.It is not the Church (as body) being offered as sacrifice, but His body of flesh, that the body or the Church maybe sanctified. The act of giving Himself for the Church sanctified it.How?Through the washing of water by the word.Which water will sanctify the Church?The water and the blood which oozed from the fleshly body of the Lord Jesus Christ. The topic of discussion which you sighted in John chapter 6 does not speak of redemption.The topic is how to have eternal life.Anyone who wants to live eternally with God must eat the flesh and drink the blood of the Lord Jesus Christ.In the entire chapter, the bread and the meat being mentioned refers to the word of God.It is the bread which came down from heaven that gives eternal life to anybody who will receive it. When the Jews heard this, they were offended because they presumed that our Lord Jesus Christ is speaking of His physical flesh and blood, so, He clarified by saying that He is speaking of spiritual things. In your comment, you hastily concluded that the phrase “the flesh profits nothing” refers to the flesh of the Lord Jesus Christ.I will copy your comment in red letters. You even have erroneously concluded that the viewpoint of Christ is in contrast to the viewpoint of the apostle Paul. That is the greatest mistake that you have committed! Let me scientifically prove this to you.Just what does the Bible mean “the flesh profits nothing”?Is it the flesh of the Lord Jesus Christ?Or the flesh of those who hear His words?If you received the words of the Lord Jesus, symbolic of the bread and the blood, it is not your flesh that will profit, but the spirit in you.The food for spirit is spiritual. “The flesh profits nothing” does not mean the flesh of our Lord Jesus Christ, as you concluded, “gains nothing for anyone”.It is His flesh that suffered, afflicted, wounded, beaten, and have died — not His word. The ‘body’ on the tree is not the ‘word’.It (the body) bore our sins.It is the body on the tree that was stricken with stripes that we may be healed. Let me tell you something to think about so that next time you will not be too hasty in your conclusions.Speaking of redemption, it is the body of Christ that was offered for redemption of sins.Speaking of having eternal life, the words of the Lord Jesus will provide it.These are two different topics which you mixed, and erroneously interpreted by your own preconceived idea. Although redemption and eternal life are correlated matters, they are not the same thing.The ‘flesh profits nothing’ does not mean the flesh of Christ; after all, He is not speaking to Himself but, to the Jews with bodies of flesh. This is a brotherly advice:Do not ever say again that the Church established by God through the Lord Jesus Christ is not vital to salvation.The only one true Church in the Bible did not branch into more than 38,000 denominations as you claim.These are not branches; they are fake churches founded by man. If a tree produced branches, they are genuine parts of the tree.If there are 38,000 denominations, as you claim now (I do not know where you got the statistics), they are not branches (look it up in the dictionary). 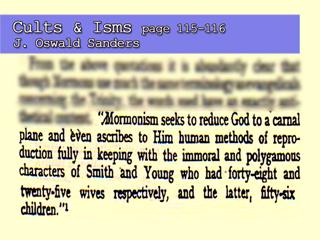 The Mormons that practice polygamy is not a branch of Christianity.It is fake Christianity. Do not ever say again that, “anyone who will say that the Church is needed for salvation is not only ignorant, but ignorant of his own ignorance”, who is now ignorant of his own ignorance?Is it me or you?I do not want to judge you. Next StoryCan We Really See The Future?